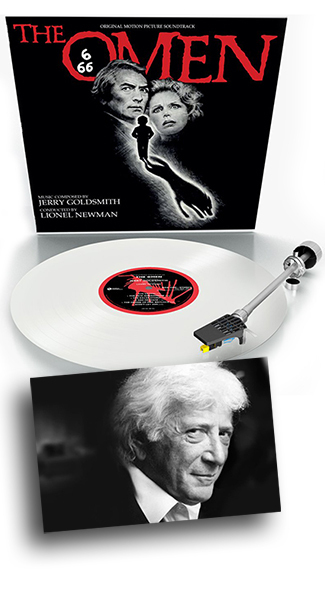 Legendary composer Jerry Goldsmith helped define the Sound of Horror with his Oscar-Winning score. Varèse Sarabande has released a limited edition (666 units) demonic white vinyl version of The Omen – Original Motion Picture Soundtrack, available exclusively on VareseSarabande.com. Each copy of this completely remastered LP release will be hand numbered. The album features Jerry Goldsmith’s (PATTON, CHINATOWN, STAR TREK) original score composed for Richard Donner’s 1976 horror masterpiece. In The Omen, American diplomat Robert (Gregory Peck) adopts Damien (Harvey Stephens) when his wife, Katherine (Lee Remick), delivers a stillborn child. After Damien's first nanny hangs herself, Father Brennan (Patrick Troughton) warns Robert that Damien will kill Katherine's unborn child. Shortly thereafter, Brennan dies and Katherine miscarries when Damien pushes her off a balcony. As more people around Damien die, Robert investigates Damien's background and realizes his adopted son may be the Antichrist.